I think the best way to start off this story and to illustrate how effective being a well-educated pregnant Mama with a support team around her can be is to say that Miri’s birth was VERY close to how I envisioned it, even down to the number of hours in birthing time (labor) and time of day she was born. Miri is our second daughter. As wonderful as our first daughter, Evelyn’s, birth was, it wasn’t the experience I wanted. Interventions were introduced and even though everything was peachy keen, I knew that I needed a natural birth in the future to help me heal emotionally from my first birth. I decided that I wanted a water birth. Evelyn’s birth also led me to become a birth doula and hypno-doula. I decided to use Hypnobabies since I had been trained in it as a doula and saw the amazing births that came out of using that childbirth education program. It was fun to be on the other side of it as a student instead of the doula – you can never know too much about pregnancy, health, birth and post-partum! My husband and I registered to take the class with my friend and doula, Lindsay. I had quite a comfortable pregnancy and my prenatal yoga at Blooma really assisted with keeping me in good shape and feeling good! The midwives say I carry my babies in my back, so I don’t gain much weight and look fairly small. Once they drew my attention to this, I realized that is why I had so much back labor and pain in my hips with Evelyn’s birth. I practiced my Hypnobabies scripts and usually sent my hypno-anesthesia to my back and hips and imagined it surrounding my baby. Miri’s guess date ended up being December 1 after several changes by practitioners. December 1 came and went and I went into work the following week and planned to just kind of hibernate in my office so that if I had to go, I wouldn’t leave anyone in a lurch. I worked through Thursday that week and listened to my pregnancy affirmations and practiced my self-hypnosis whenever I felt a pressure wave (contraction). On Thursday night, I wondered if this might be the night. It wasn’t, but I could tell we were getting close so I decided to stay home from work on Friday. My mom came over for much of the day and we talked and I rolled around hung over the birth ball on my hands and knees quite a bit. My husband, Joe, decided to work late since he figured he’d be taking some time off soon so my mom suggested Evelyn and I come over for dinner. We hung out at my parent’s house as things intensified for me. My mom graciously offered to come back over to my house to keep me company as I put Evelyn to bed and then I took a nice bath and watched Pitch Perfect to take my mind off of things. I had been working with my chiropractor throughout my pregnancy using homeopathy. He had given me some remedies for when my birthing time started so I took a dose of that to help me stay calm. My mom left at about 10:00 pm and I went up to bed. Joe got home around 11:30 and I talked to him for a bit because I couldn’t really sleep since my pressure waves were coming more frequently and I needed to move my hips. Now it gets really interesting because this is where my birth and visualized birth really start to line up. In Hypnobabies, one of the tracks we listen to is visualize your birth. It helps you envision your ideal birth so that your birth is already imprinted in your mind. So I visualized that my pressure waves would start around 2:00 or 3 am and that my water would break at home; I’d have time to take a shower; eat some breakfast; hang out on the birth ball; spend a little time with Evelyn; my mom and our doula would come over; we’d drive calmly to the hospital while I’d listen to one of my tracks along the way; I’d walk myself all the way up to the midwifery birth center; I’d get to skip triage and go straight into my room; the midwife would check me and I’d be at 9 cm; I’d push for about an hour and that Miri would be born calmly in the water at 10:09 am (total of about 7 hours of birthing time) with the room only lit by candles; I wanted to catch her; we’d hang out in the tub for a bit and then start nursing. I pictured Miri as if she’d look just like Evelyn but with brown fuzzy hair. Now back to reality. I stayed in bed until about 1:30 am and then, since I needed to move my hips during pressure waves, I decided to go watch a little TV and hang over the birth ball. My pressure waves grew stronger and then at 1:50 I felt a pop! Since I was leaning over on my forearms and knees no water ran down my legs so I thought, “Oh, either my water just broke or I’m imaging things.” I quickly stood up and went over to a floor mat that I wouldn’t mind getting wet. Yup, my water definitely broke. I was excited and things were going just how I envisioned them. I texted Lindsay to let her know and then went upstairs and woke Joe up. I didn’t want to wake him up like they do in the movies and run around like a chicken with its head cut off so I gently woke him and said my water broke. It’s funny because now as I think about this, he had envisioned that I’d wake him in the middle of the night and say something like, “Honey, it’s time” and then we’d have an easy birth in no time. So really, both of our envisioned births came true! He started to get ready and I called the midwife. A nurse picked up and I was having trouble understanding her. She said my name on the phone and I could hear someone in the background say something. The next thing I knew, my favorite midwife, Laurel, got on the phone and said jokingly, “Laura, what trouble are you causing now?” I told her my water broke. She said she’d like me to come in but I asked if I could hang out at home a bit. She said yes but no more than an hour or so. I called Lindsay and my mom and told both of them to come over. I started pulling together my last minute items and then Lindsay arrived. Our dog barked so Evelyn woke up. I told her the baby was getting ready to come and she was so excited I guess she didn’t sleep the rest of the night, according to my mother-in-law. Evelyn loves babies and I had been telling her about birth for a long time so she seemed to understand this was important and exciting. She hung out with me as I finished putting my bag together. My mom came and my in-laws popped up to say hi and good luck and to take Evelyn. I think having childcare coordinated early on took some stress off too so that I could focus since I knew Evelyn would be well cared for. We left at about 3:00 am. Joe and my mom drove with me as I laid in the back on my hands and knees and listed to my easy first stage track. The ride seemed very smooth and short to me. I know that the car ride can kind of slow things down or make Mamas anxious so I just tried to stay as calm and relaxed as I could. I was still feeling good and was excited for this journey! When we got to the hospital I took a moment to strengthen my bubble of peace (a safe space we imagine to block out negative images, sounds, things people say, etc. to help us stay relaxed and focused). Then my mom and I walked up to the birth center while Joe went to park the car. I stopped outside the doors to deal with a pressure wave. I remember when it was over I smiled and looked up and Lindsay was there. I joked about how quick and quiet she was and we went in. A nurse stopped us in the hall and said, “You must be Laura.” I said I was and she took us straight to our room. Joe came in with our things and then Laurel came to check on us. I didn’t want to know my dilation but since she didn’t say anything about getting in the tub I knew I was less than 5 cm. That didn’t bother me since I know how quickly things can change, especially in Hypnobabies births. I later found out I was at about 3-3.5 cm upon arrival. 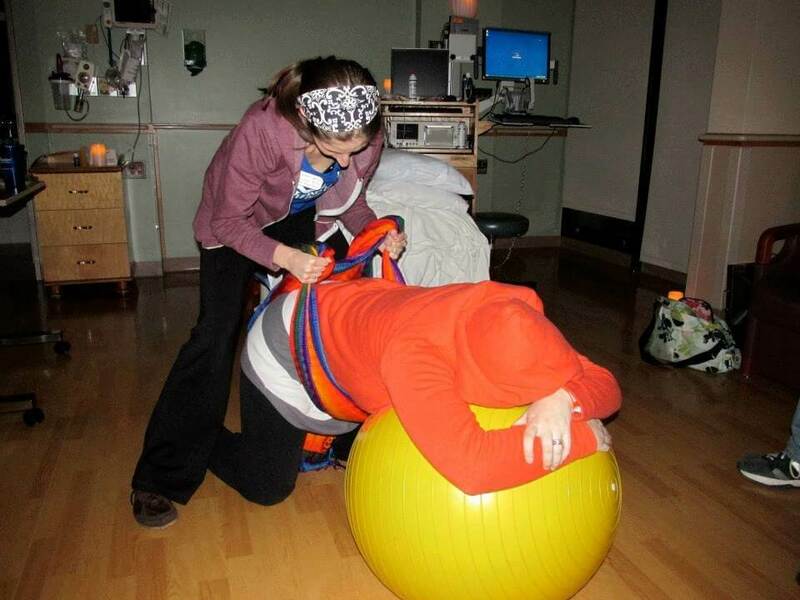 After some time on the birth ball, hands and knees and a hip release that Lindsay performed on me she suggested we try the rebozo to help baby into the ideal position. Boy did that get things moving! Since baby’s initial readings were good they just did quick intermittent monitoring the rest of the birth, which was also something I wanted. Maybe I should have been saying the above to my hip bones in addition to my muscles (haha!). Lindsay was directing me to send my peace down and to surround my baby with it. While in the tub, Laurel came to check on me and asked if she could check my progress. This is an area where I really think Hypnobabies helps. In all the cervical checks I had, which was not many, I never felt any discomfort. I turned my switch to off and relaxed. I later found out I was at about 5 cm. Laurel said I could get into the big tub if I wanted to so they started running it and I eventually wrapped myself in a warm blanket and walked to the birthing tub in a different room. The tub felt good since it covered more of my body but I was still cold so they brought me warm blankets for my shoulders. I did a lot of rocking back and forth on my hands and knees during pressure waves and then would relax between them. The room was dark and lit by electric candles just like I wanted. It was quiet and peaceful. I remember at about 8:00 am Laurel quietly told me she was going off duty and introduced me to Kathy, the new midwife on duty. It turned out to be Kathy’s last week before she retired so my baby would be one of her last, which was something special to me. Around that time I told Lindsay I felt like I needed to poop, and in doula language that means it’s getting to be push time. That means that I went from 5 cm to 10 in an hour! It didn’t surprise me that much since I went from 6-10 in an hour with my first birth but it was still exciting that I was progressing the way I had envisioned my birth. I started squatting to push at this point. For a while, I just let my body push and didn’t actually initiate the pushing. Part of our birth preferences was that I would do mother-directed pushing so all I heard were quiet encouraging words, not “push, push, push…hold for the count of 10” etc. that you hear on TV and in the movies. Lindsay would help me with each pressure wave and Joe would kind of step-in in between to encourage me and give me sips of water. I would stretch out my hips after each pressure wave and then get back into a squat that I had learned during my prenatal yoga. I continued to “ahhh” my baby out and started to initiate pushing after a bit because my hips hurt. I remember thinking that my mom might be worried about my “ahhh-ing” but I wasn’t worried about myself. I looked forward to pushing and crowning because I wanted something to distract me from my hips. I remember when Kathy said she could feel the head. Then another push and she said she could see the eyebrows. I took a pregnant pause to take the moment in. This was a turning point for me. I knew I was close and was really motivated and excited to be in the home stretch. A couple more pushes to ease the head out and then when she was out to about her belly, Kathy told me to reach down and grab my baby. I remember taking a moment to just look down and see my baby as we were still connected for one of the last moments. Since I was squatting and holding on to a sheet wrapped around Joe for support, I could only grab one arm. Kathy gently said, “Joe, grab your baby and help Laura.” He reached down and grabbed under her other arm and then we both gently lifted her out of the water. She had the umbilical cord loosely over her shoulder so I gently unwrapped it and sat back with her on my chest and stretched my legs out. She was born at 9:16 am on December 7, 2013. She was so quiet and calm but her skin color was perfect so the midwives and I weren’t worried. Then Joe said, “Shouldn’t she be making noise?” She did a tiny sneeze and we all laughed. She scored a 9 and 10 on her apgar. We hung out in the tub for a bit to wait for the cord to stop pulsating and to get to know each other a bit. My mom came over to take a picture. Joe and I had kind of preplanned this but we took that moment to introduce her as Miriam Margaret Hanstad – Margaret is my mom’s name. My mom started to cry and then laughed and said, “Are you sure you want to saddle her with that?” We all laughed but we loved the name and were happy we kept it a surprise. 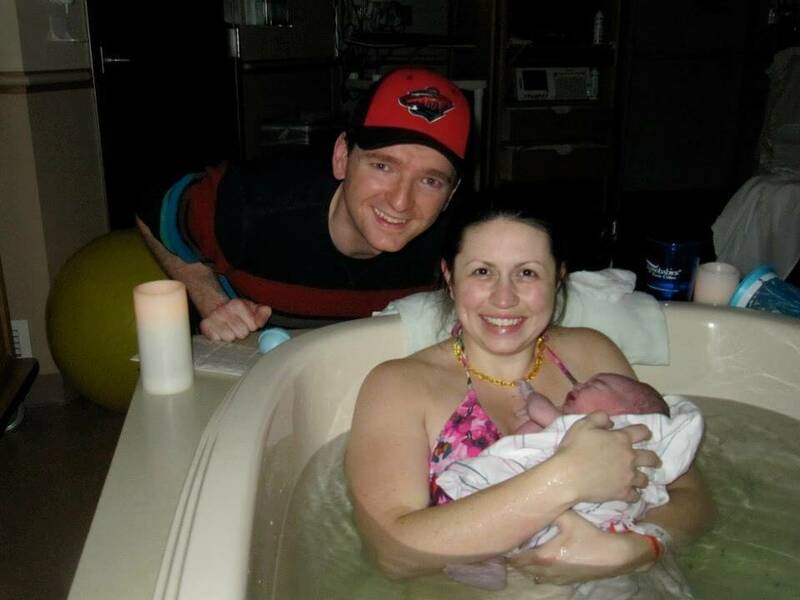 Joe took Miri and did some skin to skin with her so I could get out of the tub, birth the placenta – which was also easy since I just relaxed and turned my switch to off – and let the midwife check me out. Only a minor first degree tear that didn’t even need a stitch. Joe brought Miri over and she started nursing right away. We all looked at the placenta and then Lindsay took it to encapsulate for me. All in all, I had an amazing birth, which I credit to Hypnobabies, my support team and takingthe initiative to educate myself and make the right choices for my birth. I think it is a huge testament to Hypnobabies and having the right environment around me that pretty much the same day I gave birth, I could say I would do it again. My birth was so close to what I had visualized in my Hypnobabies practice, that it makes me excited to share with others and help them have their dream birth too! I felt like my husband was so much more prepared and educated for this birth. Sure, he witnessed a birth already but his attendance at the Hypnobabies classes allowed him to ask more questions and give more input on our birth plan and baby preferences. He really surprised me throughout our birth and after it was done I remember telling him how impressed I was with him for a couple of days (and still to this day!). I also think having a doula allowed for him to concentrate on me more or take a break when necessary. It wasn’t all on him to take care of and remember everything. I can’t say I had a pain-free birth, which Hypnobabies does not promise but it sometimes occurs, but I felt so much more prepared and confident to handle birth this time that I knew I could get through it calmly and experience the joy involved in such a momentous event. I had the right team in place including an awesome doula, supportive spouse, comforting mother and hospital care team made up of supportive midwives and nurses. My baby was calm, happy and healthy and I believe the time we spent preparing for our birth experience connected us. It truly was love at first sight – even before she was fully earth-side (as opposed to womb-side)! We had special time listening to hypnosis tracks and practicing for the birth. I even notice she gets calm when we listen to the relaxation music now as she did in utero. I wish all of the birthing Mamas a comfortable, joyful and supportive birth experience!